Up to now the trees and shrubs of the grasslands have been discussed in the previous articles. 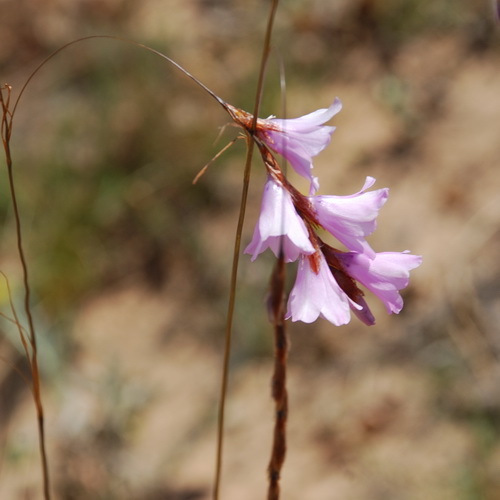 What is not known to many people is that the perennials and bulbs that occur in the Grassland Biome are only surpassed by the plants from the Fynbos Biome. There really is a tremendous variety to choose from. When it comes to beauty, there is very little that could even touch the magnificent flower of Scadoxus puniceus in early spring. The vernacular “bloody lily” is very apt when one encounters this striking bulb in the wild. In the garden it prefers dappled shade and a fairly dry spot. Once established, leave it in peace and you will have a flowering friend for a very long time indeed. A perennial that is widespread in the grasslands is the wild carnation, Dianthus mooiensis. It has the typical carnation flower, either in white or pink and is very floriferous. It prefers a sunny spot. One of my favourites is the Doll’s powder puff, Dicoma zeyherii (or for the puritans, Macledium zeyherii). When the flower heads dry, they resemble miniature Protea flowerheads and they last forever in a vase. It only grows to a height of about 300mm and is really suited for a small garden. A little bulb that can really be used to great advantage in a mixed bed is the little red Freesia grandiflora. It is a little red Iris that also prefers a dappled spot in the garden and it flowers in autumn when not much else does. Its smaller cousin, Freesia laxa, is known as the Painted Lady. Both Freesias will seed themselves in the garden to add to a natural “feel”. There are some magnificent Crinum species that occur in the Grassland Biome. 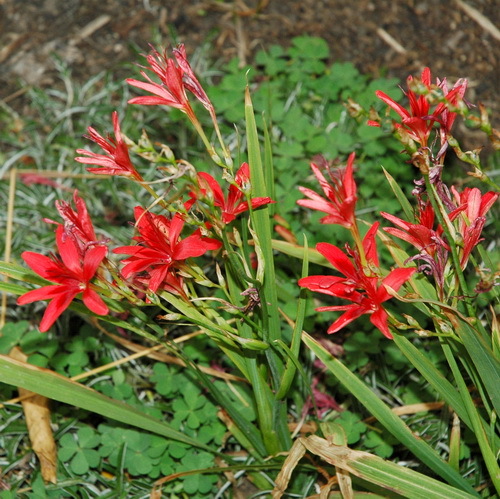 The one that is probably better known to our readers is Crinum bulbispernum, also known as the Vaal- or Orange River lily. It is fond of a wet, sunny spot and a clayey soil, but can actually tolerate quite a range of soil types. It is quite abundant along our major roads in marshes. 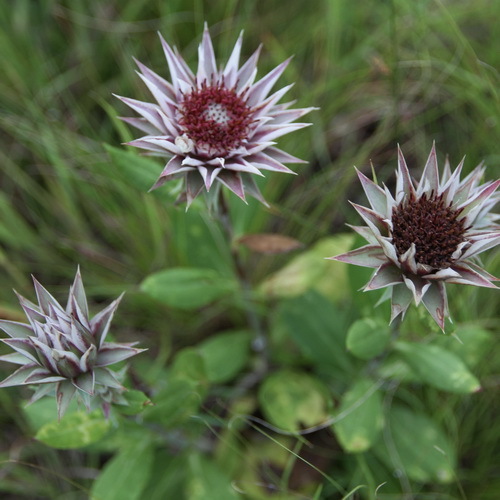 The white or maroon flowers that appear early in spring can be spotted from quite a distance. Crinum graminicola or the grass crinum can be found in more rocky conditions where it is much drier. The bell shaped pink flowers are quite a sight, but the flowering period is short. For a shady spot Crinum macowanii is the ideal companion. The plant is robust, with lemon-green leaves and the trumpet-shaped white flowers awesome, especially if you can enjoy a cup of tea under the same tree. Although quite rare in our area, the genus Dierama, or hairbells, is really worth a try in a sunny spot. The leaves resemble that of the wild iris (Dietes grandiflora) but the drooping pink flowers are born on long pendulous spikes, sometimes up to two metres tall. I trust that this has wetted your appetite so that you can appease the appetites of our feathery friends. Please tell us about some of your gardening experiences or indigenous plants that you have grown successfully in your garden. Dr Johan Wentzel can be contacted at 082 801 1741 or wildflowernursery@vodamail.co.za for any constructive inputs.